My favorite moment of the entire week. I’ve never seen anyone so excited to know what second person point of view was in my life! My current teaching assignment doesn’t allow me to focus attention on my classroom’s lending library as much as I would like, but you still do get those moments where young people who are excited to read find out they have access to great books in my room. Those moments are wonderful. Students are allowed to read a book after they are finished with the Ohio Graduation Test, so my book nook did a brisk business over the past week. I’m enormously proud of my classroom’s lending library. I’ve worked pretty tirelessly over the last five years to create a space full of awesome books for teenage readers, including a sizable section of graphic novels. I scour thrift stores, secondhand shops, and yard sales to either find good books for my classroom, or books I can sell at a profit and use the cash I get for those books to buy better ones for my classroom. Our school’s media center has not received any funding from the state of Ohio for almost TEN YEARS, people. It’s a travesty I try to combat a little with my collection of books. 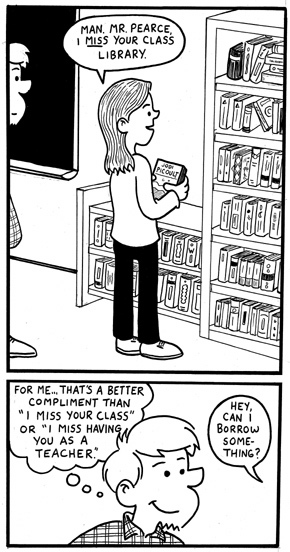 Teacher Comics: It’s that time of year again! I’ve been feeling a little off this year and recently I realized… one of the reasons (weird as it sounds) is that this is the first year in about 8 years where I’m not teaching Romeo and Juliet. Oh, I did Shakespeare of course, my 10th graders took a run at Julius Caesar I feel was pretty successful. Still, I found I missed teaching something I know SO well… and enjoyed quite a bit. 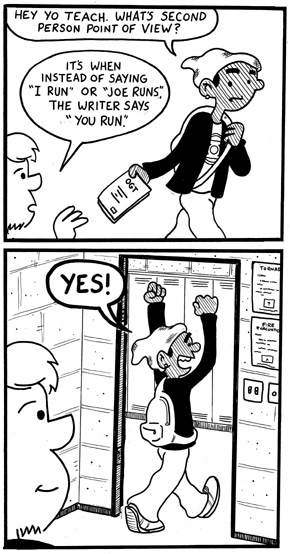 If there’s one thing I’ve done a lot of comics on in these past few years, it’s been Romeo & Juliet! Hey everyone… I just thought I’d let folks know, over the next few weeks I’ve decided to do sort of a “greatest hits” thing on the blog. I’ll be reblogging some of my favorite comics over the past few years with perhaps some additional commentary about the whys and wherefores of the strips themselves. Yes, this is sort of a stop gap until I can get around to putting up new strips… of which I have a bunch, I swear! I just need some time to ink them. Maybe over our upcoming Spring Break. At any rate, enjoy the reruns, I hope to be back to posting brand new stuff really soon. You are currently browsing the Teachable Moments blog archives for March, 2016.